A dynamic and thought-provoking speaker, Kevin Aguanno has delighted audiences with his practical and insightful presentations. Focusing on management topics, he takes the dry worlds of business and technology and brings them to life with colorful and humorous stories that make complex issues easily understood by everyone. An award-winning speaker, author of multiple-books, and executive project manager, Kevin has spoken at conferences, professional association chapter meetings, and private corporate functions internationally. "Kevin's presentation was outstanding. The Trent students were entirely impressed! Quite frankly, I can't imagine a better introduction to AGILE project management." "Your enthusiasm is contagious, and your style very lively and no-nonsense. You speak with great credibility, especially as you back what you say with colourful descriptions of your own rich project experience. Outstanding!" -- J. Niggemann, President, ThoughtBlade Inc.
"I convey thanks on behalf of the entire team on the account for your amazing session on Agile Project Management. I have received tremendous feedback from the customers regarding your session and the way you clarified doubts and explained the underlying facets of Agile PM. As a followup to the session, we have decided to begin execution and management of ‘select’ projects in the Agile way as a first step in the account. We would be following the best practices and implementing the 'Agile principles' in these projects and will observe the results. We hope to share our lessons and experiences in these projects in the near future. Once again, please accept our thanks for your stellar contribution in this regard. We are looking forward to further fruitful collaborations with you in future." "Thank you for this wonderful talk. You quickly captivated the audience with your right-to-the-point explanations. As an experienced high-school teacher, I admire the way you maintained the interest for the full length of the talk and for your ability to make everything simple and entertaining at the same time. I brought one of my grade 12 student with me, which I introduced to XP last semester, and he could easily follow your presentation and make some relations with the material previously seen. I can assure you the faculty and the alumni present were delighted with your presentation." "Kevin is able to knock the dust off the old tombs of software development practices and brings an energized, fresh perspective to his audience. I think the industry would do well to listen to what Kevin has to say and that’s not difficult given his ability to hold a crowd captive with a wealth of well-delivered content and anecdotes. I think every one involved in software and IT needs to hear this stuff." 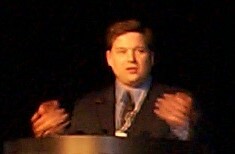 At the 2005 Project Management Leadership Exchange in Orlando, Florida, Kevin Aguanno presented “Agile PM: Managing in the Face of Ever-Changing Requirements.” In formal feedback from the event, 97.9% were happy with Mr. Aguanno’s ability. In another presentation at the same event entitled “The Great Escape: Troubled Project Recovery Using Agile Project Management,” 100% were pleased with the speaker’s ability. "Once again your presence has brought yet another event to a higher level of quality; helping to ensure the success of the Impact conference. At dinner I heard raves about your presentation, as I knew I would!" In formal feedback from “Peer to Peer: A Forum for Growth,” the 2nd annual PMI Southwest Ontario Chapter (SWOC) conference, 96% of attendees responded that Kevin Aguanno “was interesting and held my attention,” and 93% felt that Kevin’s presentation exceeded their expectations. "Thank you for your excellent presentation at ProjectWorld. It must be very satisfying to present to an overcrowded room. I will certainly buy and read one of your books. What I particularly found interesting in your presentation is first the history of the topic (the presentation showed to me that you were highly skilled in the area of sw development methodologies) and second, the combination of a high abstraction level with a number of in-depth topics which are of interest to a large percentage of your audience (iterative/incremental and three agile PM methodologies)." "Kevin Aguanno was a presenter at the CIPS Annual Conference INFORMATICS 2004, where he delivered a tutorial on 'Ever-Changing Requirements? Use Agile Methods to Reduce Project Risk.' Of our delegates that attended Kevin’s session, 96% recommended that he be invited back to present again. As one of the main conference organizers, I personally found Kevin helped to make my job easy as he was very prompt in responding to my requests." "Best speaker we’ve had all year! (And I’ve been to all the meetings.)" "Your presentation was a great hit. We won’t have the full survey results until next week but the email/calls have all identified your piece as a highlight of the day. Thank you so very much. You rock!" "I was listening to your presentation yesterday and I have never been so much impressed in my life. I was so much attuned to and could feel your passion for the business during your presentation. You vocalized what I’m thinking, and in Germany we say 'you spoke out of my soul.' Listening to you yesterday gave me hope and confidence that I’m following the right way. Thanks again for the motivation and your excellent work." "Agile is all the buzz, and your discussion was packed wtih good information. Well done!" "Thank you very much for the time taken to prepare the presentation and share your thoughts at our SIG meeting on Monday. Based on the feedback sheets from the attendees, it went extremely well [. . .] It even initiated a very interesting and lively discussion after the meeting." "Thank you very much for your superb talk titled 'Agile Project Management Using SCRUM'. Your presentation was top notch, punctuated by memorable stories, your explanations clear and to the point, and your enthusiasm was contagious. As a result of your talk, I have placed the reading of Ken Schwaber’s book on my list of priorities." "Thank you again for a very informative and inspiring talk yesterday at the Toronto SPIN Agile Methods seminar. Your advice on how to sell agile methods to executives is invaluable." -- N. Modjeska, Sr. Product Developer, CaseBank Technologies Inc.
"It was a pleasure to see you as a speaker. Your content & delivery were exceptional; we couldn’t have asked for anyone better. Your talk was perfect for the HBS Case Study at hand, and I believe everyone in attendance experienced the value of the session." "That was fantastic! Thank you for taking the time to present to us today - you hit on all the key interests & issues and your answers were thorough and are going to be very helpful going forward with our sw engineering process development." "I would like to express my sincere gratitude for taking time out of your busy schedule and visiting us at Ryerson University yesterday night, and sharing with us - in length - your valuable insights. Again, I would like to re-emphasize that you, very beautifully, summarized the core learning of CCPS731 (Software Engineering) course in your 2 hours instructional speech … Thank you." "I enjoyed your 'Great Escape' presentation on Thursday. You presented some very useful ideas, and I especially appreciated the context and examples you provided to reinforce the points." Review some of the glowing feedback Kevin Aguanno has received for both his keynotes and workshops. Winner of University of Toronto's coveted SCS Excellence in Teaching Award (1999), Kevin Aguanno brings humour and energy to challenging topics. Using practical examples from his working life, he adds life to abstract topics. Kevin Aguanno's Time Management for Students CD-ROM, produced in conjunction with York University, won an award from the Association for Media and Technology in Education in Canada (AMTEC) in May 2000.